Why am I ever surprised at how God works? Last year I did an advent countdown with my kiddos by wrapping 24 Christmas books we already owned and having the kids open one each day in December. Only in real life it was more like I wrapped a book 12 seconds before I gave it to them to unwrap because that’s how organized I can be. 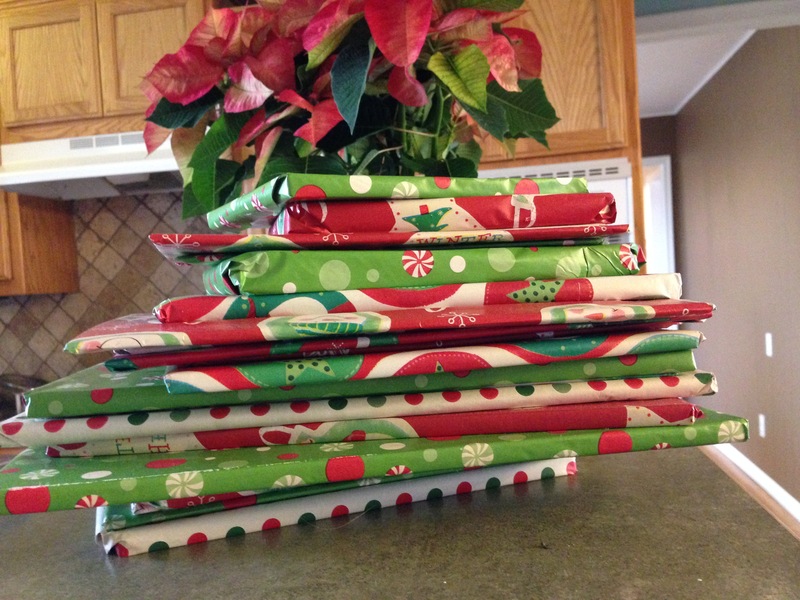 So at the end of the season I wrapped the books before I put them away and this year I was ready! I had also been planning to add a RACK countdown to our Christmas traditions. (That’s Random Act of Christmas Kindness!) Like the books, I planned to do one random act a day, using these cards I found on Pinterest. I wanted to try and explain it all to the kids this morning after we read our countdown book. And this morning, wouldn’t you know it, God did the coolest thing! I pulled an unknown book, wrapped last January, from the countdown stack and sat down to read it to the kids. When they started tearing the paper from the back I frowned in confusion. What book was this? A second later I saw it. A new book I’d purchased last year from an outlet store because I needed a 24th book for the countdown. A book we’d read once, maybe twice. A book about Random Acts of Christmas Kindness I hadn’t even remembered. And why does that surprise me? So if you are wondering, here is the list I’m planning to work from. And Merry Christmas! 1. Put carts away at stores while Christmas shopping. 2. Send a gift card for a meal to friends with a sick baby. 3. Vacuum the house of a friend while she is gone. 4. Take cookies to the Farm Bureau office. 5. Leave a sheet of stickers in a library book. 6. Take a new coloring book and crayons to the doctor’s office. 7. Give a care package of cocoa and candy canes to neighbors we don’t know well. 8. Send Great Grandma homemade Christmas cards. 9. Send cards to servicemen and women. 10. Take cookies to the sheriff’s office. 11. Donate a DVD to the hospital. 12. Take canned goods to the food bank. 13. Put a gift in the Toys for Tots box. 14. Write nice messages in chalk on the sidewalk at the park. 15. Leave quarters on the bouncy ball machine at our favorite restaurant. 16. Tape a bag of popcorn to a Red Box. 17. Bring a gift to the Sunday School teachers. 18. Read a book to a resident of a nursing home. 19. Take friends out for lunch (and give their mama a small break!). 20. Bring cookies to the librarians. 21. Take baby wipes to a daycare. 22. Chose a toy of their own to donate. 23. Make cards to send to service men and women. 24. Cook a meal for another foster family.